Background: Single incision laparoscopic cholecystectomy (SIL Cholecystectomy) is a relatively new approach in management of gall stone disease. 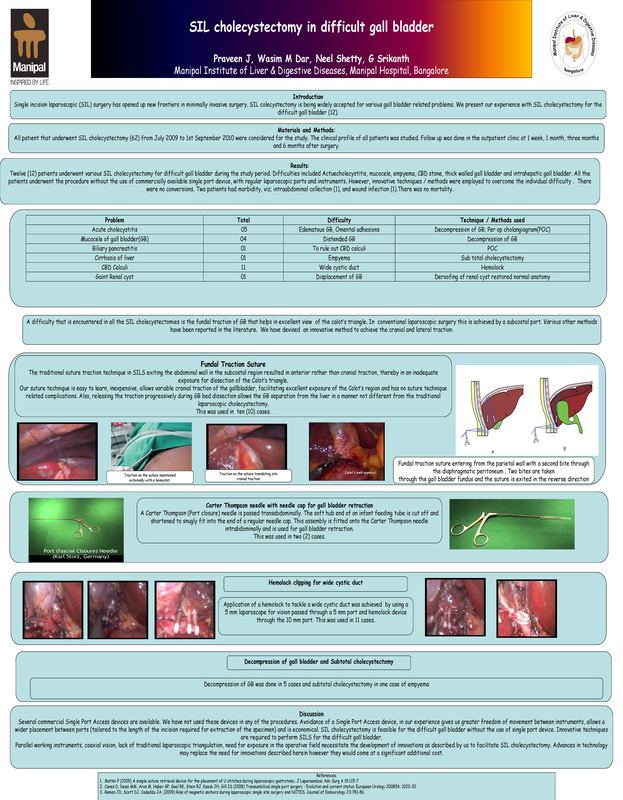 We present our experience with SIL cholecyetectomy for the difficult gall bladder. Materials and Methods: Clinical details of patients who underwent SIL cholecystectomy during the period July’2009 to 1st September 2010 were studied from a prospective database of patients undergoing SIL procedures in the Department of Surgical Gastroenterology at Manipal Institute of Liver and Digestive Diseases. Patients with a ‘difficult gall bladder’ for the purpose of this study included those with acute cholecystitis, mucocele, common bile duct (CBD) stones, biliary pancreatitis, cirrhosis of liver and wide cystic duct at surgery. Operative techniques employed to manage these difficulties were studied. Follow up was done in the outpatient clinic at 1 week, 1 month, three months and 6 months after surgery. Results: Of 64 patients who underwent SIL cholecystectomy during the study period, twenty eight patients, 24 female and four male, with age ranging between 23 to 70 years underwent SIL cholecystectomy for difficult gall bladder . Difficulty was secondary to acute cholecystitis (6), mucocele (4), CBD stone(14), biliary pancreatitis (2), cirrhosis of liver (1) and wide cystic duct (5). Single 2.5 cm umbilical incision with multiple ports, long laparoscope and a single articulating grasper were used in all patients. Operative techniques tailored to overcome the difficulties included fundal traction suture (28), transaction of gall bladder neck and disimpaction of stone (3), subtotal cholecystectomy with endosuturing (1), hemo-lock clipping of the wide cystic duct (6). There were no conversions. One patient had wound infection. There was no bile duct injury or mortality. Median postoperative stay was 1 day (range 0 to 2 days). Cosmetic result was excellent with no visible scar at one month. Conclusions: SIL cholecystectomy is feasible for the difficult gall bladder without the use of single port device. Innovative techniques are required to perform SILS for the difficult gall bladder.